There are 2.9 billion email users worldwide. While you may not have that many people on your email marketing list, demand for email is still high. In fact, 61% of consumers say that they enjoy receiving promotional emails weekly, and 38% want emails more often. Marketers spend around 20 hours per week on non-automated email campaigns and 5 hours a week (20 hours per month on average) for automated campaigns. 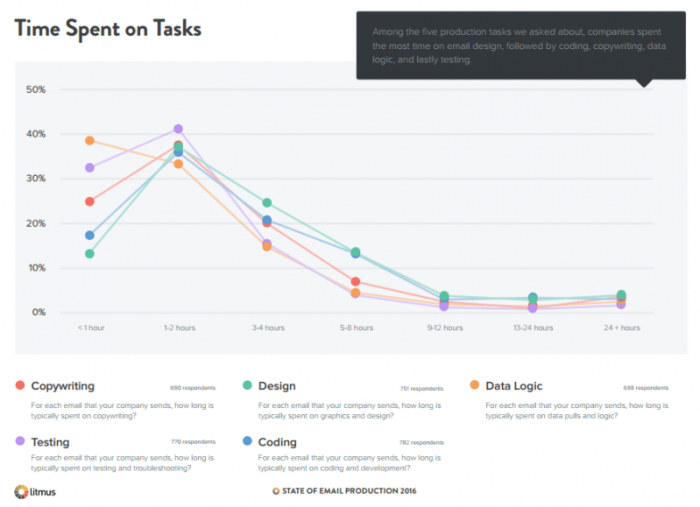 Check out a tool like Time Doctor to improve your time tracking and productivity spent on emails. Even on the low end, that’s over 12% of the work week spent on emails. As email lists continue to grow, a marketer’s time and energy become significantly more limited. So how should they keep pace? Better yet, how do you cut your time spent on email in half? Crafting an effective email campaign will always take time. You can send out an email in 30 minutes or so with the right tools. But realistically, you should be spending around 2 hours a week for an automated email series. But if most marketers spend between 5 and 20, what’s taking up that extra time? In some cases, automation can eliminate or reduce the time you spend on those tasks. 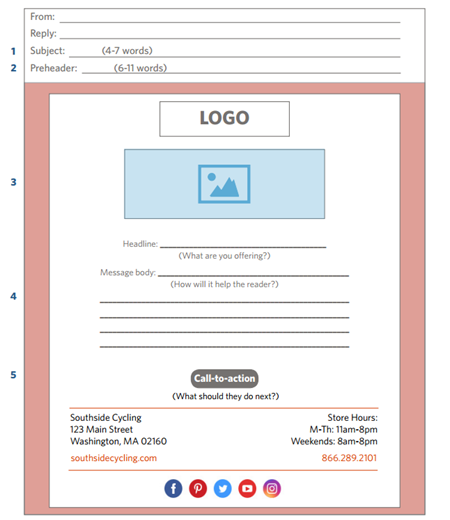 Using templates, for example, can save time designing a decent-looking email. But in other cases, such as copywriting, automation won’t help you. You have to craft the message yourself. 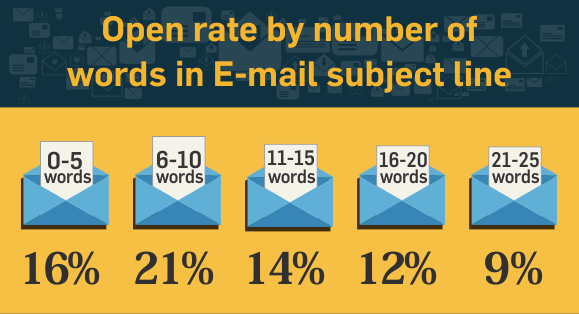 Writing an optimized email subject line that gets higher click-through rates (CTR) takes effort. Finding shortcuts for those tasks can be difficult, but not impossible. Here are a few ways you can cut your time significantly on the non-automated parts of email creation (and even the automated ones, too). Email body copy and subject lines will take time, but it doesn’t have to take you more than 15-30 minutes to write an effective email. Start with a short, benefit-focused subject line. The fewer words, the better. Using six to ten words is ideal. You can also use proven formulas to save time. The same type of copy that works for article headlines often works for email subject lines, which makes it easy to test out your subject headlines. Using a tool like CoSchedule’s Headline Analyzer, you can easily test multiple headlines to see which is likely to yield the best results. You’ll get a ranking out of 100 for your copy (70 or higher is considered pretty good). The whole process takes seconds, and you can repeat it as many times as necessary to get a clickable subject line. When it comes to writing email body copy, short and to-the-point can be just as effective as a long sales letter. So if you’re short on time, write shorter emails. With some exception, most marketing emails look the same. And there’s nothing wrong with that. Even in the odd case when emails are different enough to grab attention (a silly headline, a provocative image, etc. ), most people know what they’re getting. And they want to know what they’re getting when they open an email. You don’t have to go to any great lengths to redefine your email designs. What works for your competitors will also work for you. Aside from testing, design is one of the tasks that will inevitably take up the most time for email marketers. But with so many automated solutions out there with their own templates, there’s no reason to reinvent the wheel every time you have to create a new campaign. So use templates whenever possible. Ideally you want a master template with all variants of content blocks defined, so you won’t have to think about the design, just put in the content. If your email marketing software doesn’t have a great editor, you can turn to an external one to create the email and pop the HTML into your sending tool. Here is a review of several drag-and-drop email editors. They all use templates that you can save. Smart features in an editor or email marketing tool that you want to look for that save a lot of time? * Re-usable content (save a block of content you made once and just pop it back into a next email) . 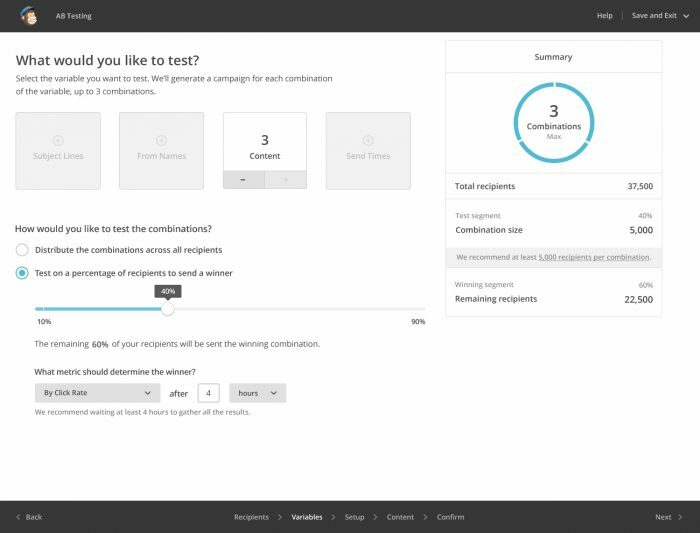 * Simple sending of test emails and checking personalization. 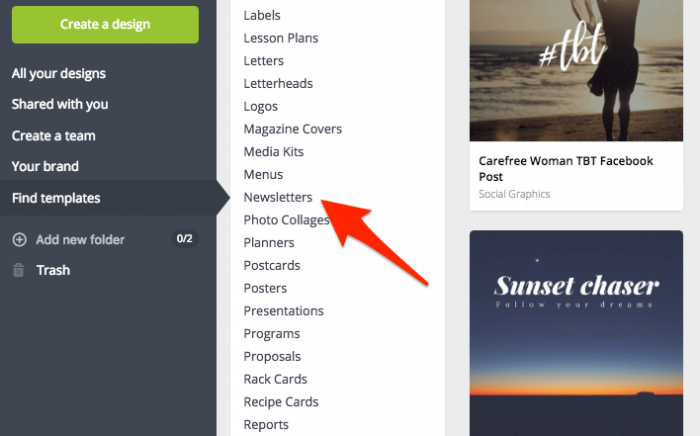 For custom images, you can create headers — yes, even branded headers — or other images in a few minutes using Canva (also free). This can be a great tool for marketers or even business owners who are doing it all. If you don’t have a designer on hand to create your emails for you and you don’t want to waste countless hours designing an eye-catching email, then use the tools that already exist to make the job easier for you. Most of the time, they’re already designed to be mobile-friendly and interactive, which saves you the time you’d normally spend building complicated emails from scratch (or hiring a designer to do them). And the best part is that your subscribers won’t know the difference. Depending on how big your email lists are, you may have a lot of segmenting to do. But segmentation doesn’t have to be complicated to be effective. Even basic segmentation like separating lists by certain demographics can improve open rates and CTR. When MailChimp measured stats “across all segmented campaigns,” all segmented campaigns performed markedly better than those without it. Some email list segmentation strategies will take more time than others. So when you want to keep things short and simple, focus on the few segments that really matter. If your email capture forms aren’t already set up to capture them, there are tools that will help you find those demographics without wasting hours hunting them down yourself. Our API, for example, can help you find corporate emails from your list and verify that their information is correct. If there are multiple addresses, you can see which ones are still active, so you’re not wasting time sending emails to the wrong people. You can import any information you find directly into your email service provider (ESP), too. Most ESPs will also automatically segment lists for you for things like location. 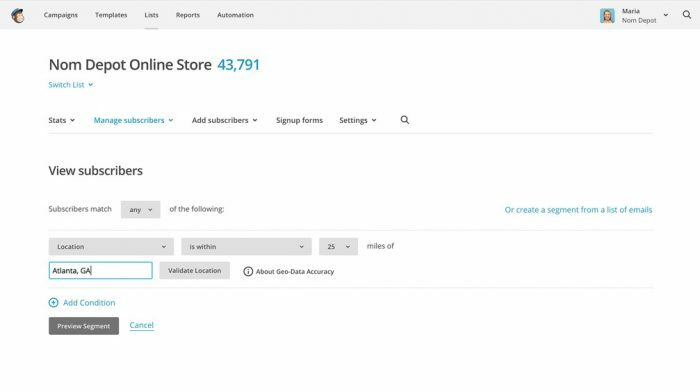 MailChimp, for example, tracks location data and allows you to filter lists quickly. The benefit to using geolocation as a segment is that, depending on your ESP, it’s relatively easy to do. But not a lot of marketers remember to do it. Consider using this feature if you want to create unique content in a short amount of time. Consumer behavior is another effective segmentation, but one that can take up a lot of time if you’re not careful. Some ESPs are wising up to the use of consumer behavior as a segment. Campaign Monitor, for instance, has automatic segmentation based on past user behavior. Even if your ESP doesn’t already provide segmentation for user behavior, there are other tools out there that can help you quickly and easy pull reports. ComScore, for example, measures online behaviors and creates reports for campaign measurements like reach and frequency delivery. This takes a few minutes and can point you in the right direction. Look for tools available through your ESP first, though. 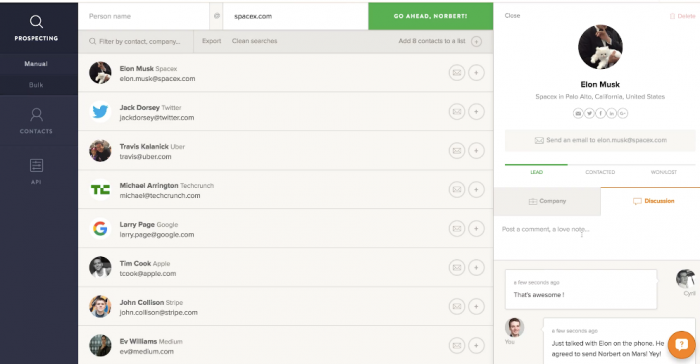 If you can segment all from one place, you can save time searching for relevant tools. A/B testing, or split testing, is almost inevitable (if you want to see campaign success, at least). But if you don’t want to spend 20 hours of your week just on the review process, you’ll need a faster way of testing your email marketing campaigns. First, decide which element of your email you want to A/B test. Next, you want to decide whether to test your whole list or just part of your list. In the majority of cases, you can test your entire list. This will give you an accurate picture of how your opt-ins are responding to the changes made to the elements above. But if you have a very large list, consider testing by your top list segments. In terms of time savings, most ESPs have built-in tools for A/B testing. Campaign Monitor, MailChimp, and ActiveCampaign all have them. Split the list you currently have into two separate lists. Send one version of your campaign to one list and the other version to the remaining list. The point is not to overthink things. If there’s no noticeable difference in your data, you might not have to keep testing and retesting. The worst time waster for many marketers is overthinking the process. Consider that your emails might be optimized enough as it is. You might also find that your effort to grow your email marketing list is eating up your time. Growing your subscriber list can be a big challenge, and it involves researching tools to create pop-up forms, keywords in landing pages, and so on. Automating a few of these steps can help alleviate some of that burden. 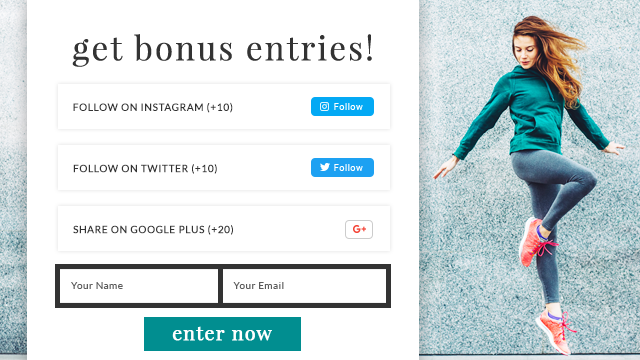 Tools like Wishpond will enable you to quickly create Facebook contests, pop-up and opt-in forms, and landing pages. You can also integrate it with any major ESP to link your email CTAs directly with your newly-created content. You can create an entire lead generation email and landing page in a couple of hours. Some ESPs have other tools that will allow you to quickly create lead generating content that works with your emails. 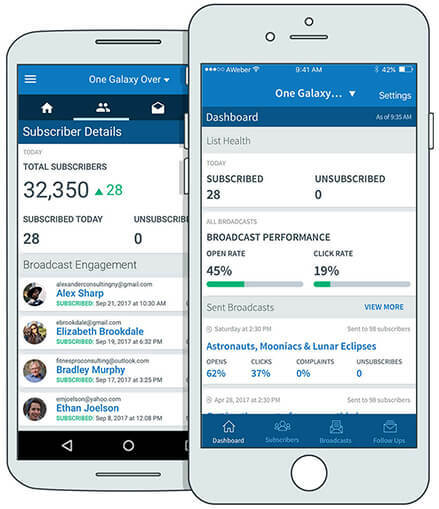 AWeber’s Atom App, for instance, lets you add new subscribers at any time, and you can manage and clean your lists. This allows you to quickly perform data analytics or segmentation, even if you’re not next to a computer. A great way to collect emails in an engaging way is a lead generation quiz. The quiz can be embedded on your site, or it can be used during offline events such as a trade show. The participant learns something useful, while you collect data which can be used for subsequent segmentation. You can use tools such as Zapier to transfer this data to your ESP. If you want to connect with other brands or influencers directly but don’t have the time to send out individual emails to every person, consider creating a LinkedIn opt-in form and mass emailing contacts on your list. Segmenting your LinkedIn profiles by groups is fast and easy. And you don’t have to spend a lot of time crafting a fancy email since they’re connected with you already. In other words, they have an easier buy-in, so it takes less time to sell them on subscribing. These sorts of quick-win strategies will free up time that you can better spend on other marketing tasks. Marketers have plenty of other things to worry about during the week than just writing emails. You don’t want to spend half of your work week writing email campaigns (unless that’s your only job, of course). The key to success is finding tools that can handle much of the brunt-work for you. Most ESPs have these tools built in. You just need to access them. When it comes time to do more “hands-on” work like writing compelling subject lines or crafting the copy of your email body, focus on the essentials that will sell. 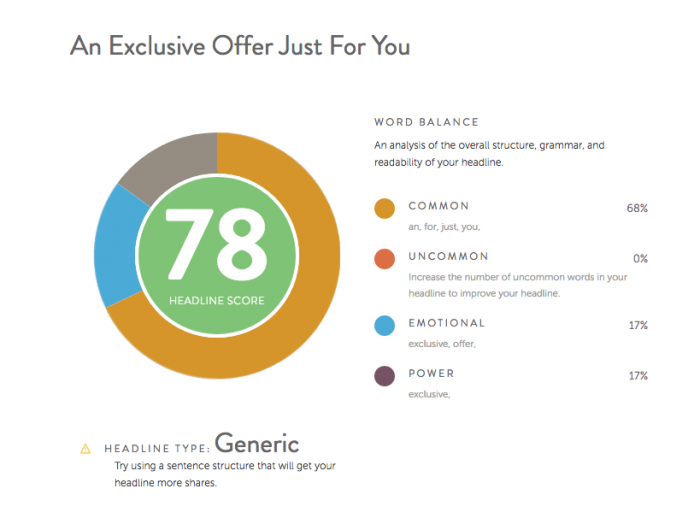 Use short headlines and write about the benefits. For more complicated tasks like segmentation and A/B testing, use the resources available to you and keep it as simple as possible. Create a few lists and test things once or twice. You have too much to deal with during the rest of your week to sweat the small stuff in email marketing. So don’t overthink it.